the European Space Agency (esa) has come out with a world fire atlas based on satellite data on forest fires collected over a decade. The maps are available to users online in near-real time (within six hours of a fire). The data was taken from instruments called Along Track Scanning Radiometers aboard two esa satellites -- ers -2 and Envisat. Sensors on the radiometer measure the temperature of infrared radiation coming from the Earth's surface. They are capable of detecting fires as small as gas flares from industrial sites. A radiation with temperature exceeding 38.8C indicates a fire. Fires are detected best during night, when the surrounding land is cooler. 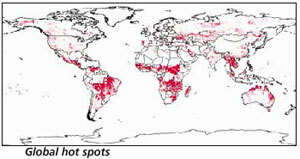 Forest fires destroy more than 50 million hectares of forest annually, leading to atmospheric pollution. But all forest fires are not bad. "In pine forests in the Himalaya, villagers use controlled fire to regenerate local herbs and grasses," says R L Semwal, an expert on forest ecology. In the us, natural fires in national parks and reserved forests are allowed to burn themselves out, unless lives or property are threatened. In some instances, controlled burning has been used as a tool in forest management. Experts, however, say that quantifying fire is important as they contribute significantly to the global budgets of greenhouse gases. For instance, in 1998, fires across Borneo emitted up to 2.5 billion tonnes of carbon, equivalent to Europe's entire carbon emissions that year. "The atlas will allow ecologists to address both new and old questions regarding the role of fire in modifying the natural ecosystem," says Matt Fitzpatrick, an ecologist at the University of Tennessee.